Last Sunday was a very special day. It was the culmination of countless hours of planning, organizing, weather forecast watching and a little bit of anxiety. But, by and large, everything went like clockwork. And I have to say our girl did us proud. She looked absolutely enchanting. And her groom wasn't bad either. In fact, they make the perfect couple. The ceremony was held outdoors at a winery with 360 degree views of the surrounding hills. The weather was perfect - warm and sunny with just enough clouds in the sky to make the view even more beautiful. The bride walked down the red carpet on the arm of her proud father and linked hands with the groom, Zbys. A celebrant conducted the ceremony and vows were exchanged. The bride and groom wrote their own vows, which were so moving that, to my surprise, I became quite emotional. As you may have guessed, Aurelia is one of my students and has been for a number of years. She is the youngest in the class and the rest of us have taken a rather motherly attitude towards her, which she tolerates with good grace. She is a young woman with the sweetest disposition and we are all quite fond of her. 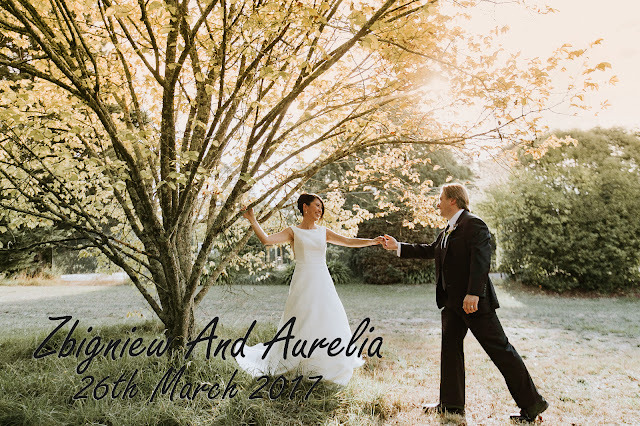 When Aurelia announced that she would be getting married, we discussed what would make an appropriate wedding gift and we settled on making the flower arrangements for the reception. As an Ikebanist herself, Aurelia was very pleased with the idea of different ikebana arrangements on the tables. The bridal and bride's maids' bouquets were expertly made by Glenda Nielsen and suited the girls perfectly. On the day, we all met at my place and finalized our arrangements, We then loaded them and us into two cars (that took some doing! ), drove 45 minutes to the winery and set up without a hitch. Having allowed plenty of time for any possible problems, we were early for the 3.30 ceremony so we took ourselves to lunch. Back at the winery, we were just in time to see our girl walk down red carpet. We watched as the celebrant pronounced them husband and wife, we congratulated them, took some photos, did a final check of the arrangements in the reception room and left. Lucy and I returned the next morning to collect the arrangements. It was a relatively small wedding - about 80 guests (by Greek standard, it was tiny), requiring only 11 arrangements. As I mentioned before, they were completely different, showcasing each person's style and creating interest in their diversity. floating. Here, too, I used white cedar berries for contrast. Even though the arrangements were quite low, on the bridal table I placed the two parts a little bit more separated so as not to obstruct the view of the newlyweds from the guests in the room. We were very happy to have a small part in Aurelia's wedding and we wish her and Zbys a lifetime of happiness. Bye for now and I hope to see some of you in Okinawa.